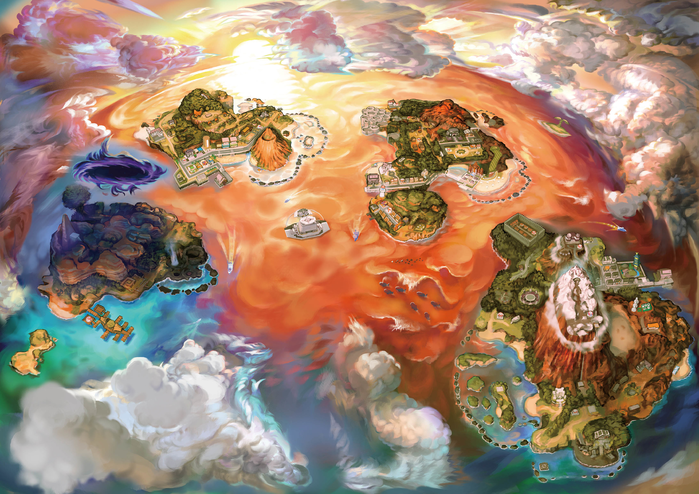 Pokémon Ultra Sun and Pokémon Ultra Moon (ポケットモンスター ウルトラサン・ウルトラムーン) for the Nintendo 3DS takes place in the Alola Region. The game was announced during a special Pokémon Direct on June 6th, 2017 where Tsunekazu Ishihara, president and CEO of The Pokémon Company, and Junichi Masuda, Director of GAME FREAK presented the new Pokémon titles for Nintendo's 3DS consoles. The games were released worldwide on November 17th, 2017. A new story unfolds featuring Necrozma alongside the Legendary duo in Pokémon Ultra Sun and Pokémon Ultra Moon. Ominous dark clouds begin to spread and the secrets of Necrozma and the Alola region, which were never disclosed in the previous games Pokémon Sun and Pokémon Moon, will finally come to light. 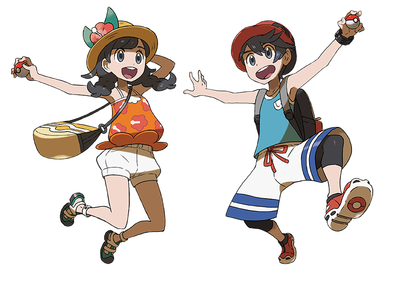 The main characters that appear in Pokémon Ultra Sun and Pokémon Ultra Moon feature brand new styles. Players can pick their appearance at the beginning of the game and choose either Rowlet, Litten or Popplio to begin their adventure in style. Also discovered in the story is a new Z-Power Ring which players will acquire in the game and can activate to use an even wider variety of Z-Moves. A physical toy of the new Z-Power Ring was available at launch to purchase and interacts with the video games. 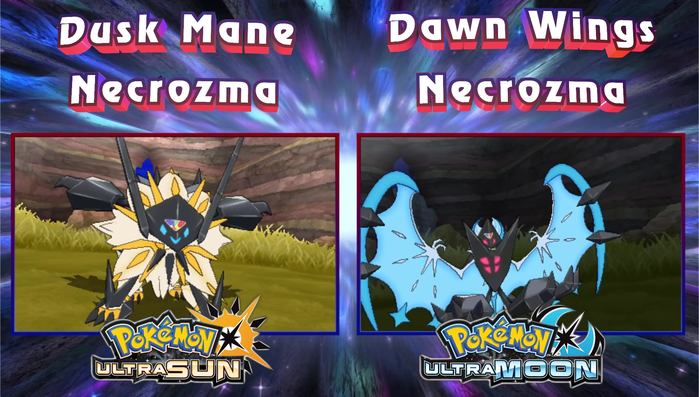 During the players adventures, they will encounter Dusk Mane Necrozma in Pokémon Ultra Sun and Dawn Wings Necrozma in Pokémon Ultra Moon. An untold story unfolds on a grand scale, where the Legendary Pokémon that steals light, Necrozma, has transformed into two new forms: Dusk Mane Necrozma, who took over Solgaleo, and Dawn Wings Necrozma who took over Lunala. In Pokémon Sun and Pokémon Moon, Trainers took part in the Island Challenge. 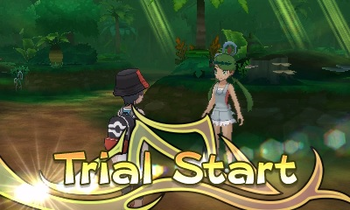 In Pokémon Ultra Sun and Pokémon Ultra Moon, the Island Challenge returns but this time some of the challenges are different and there is an additional new Trial. 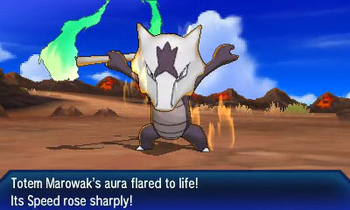 As players work through the Island Challenge they will be confronted with trouble involving the Legendary Pokémon Necrozma. Trainers will meet mysterious people and Pokémon as they witness the new dangers closing in on the Alola region. The trials are hosted by the captains found on each island and the content of the trials can vary from running around the area to trying to solve puzzles. 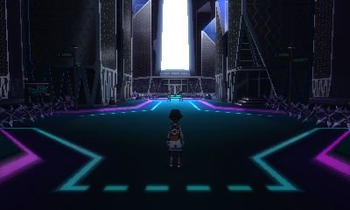 At the end of each trial, the player will face a powerful Pokémon known as a totem. If they defeat the Totem Pokémon, the trial is completed. The final trial of each island is the grand trial, where the player faces off against the island kahuna! More than 400 Pokémon are discoverable in Pokémon Ultra Sun and Pokémon Ultra Moon, many of which were not available in Pokémon Sun and Pokémon Moon. Some of these Pokémon will only appear depending on which version of the game is played. For example, in the same patch of tall grass where Houndoom will appear in Pokémon Ultra Sun, Manectric will appear in Pokémon Ultra Moon. In the Alola region you can ride Pokémon in many areas and have them help you out on your journey. Now, in Pokémon Ultra Sun and Pokémon Ultra Moon you can ride the waves on the vast ocean with Mantine, thanks to the brand-new Mantine Surf. 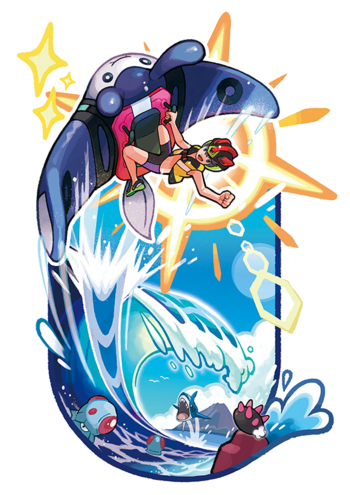 Mantine Surf isn’t just a way to get between the islands of Alola, but it is also a sport in its own right, with Trainers competing for the highest score by pulling off a variety of radical moves. Become a pro and pull off some super cool tricks across Alola’s sea with Mantine Surf! 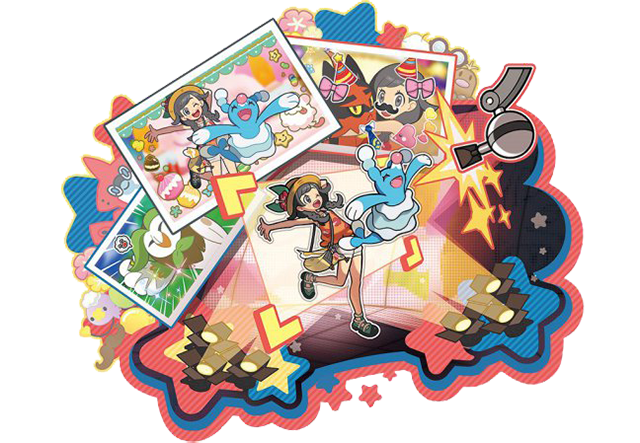 Another new feature making its way to Pokémon Ultra Sun and Pokémon Ultra Moon is the Alola Photo Club. Trainers can now take photos together with their Pokémon and choose backgrounds, camera angles, Trainer outfits, poses and more to capture amazing images. After the shoot, players can decorate the photos with cool frames and over 100 different stickers to create the perfect photo. These photos can then be shared with other players through communication features on the Nintendo 3DS family of systems. When players take photos with their Pokémon, their Pokémon will become more affectionate towards them. In Pokémon Sun and Pokémon Moon, the Pokémon Rockruff could evolve into either Midday Form Lycanroc or Midnight Form Lycanroc. 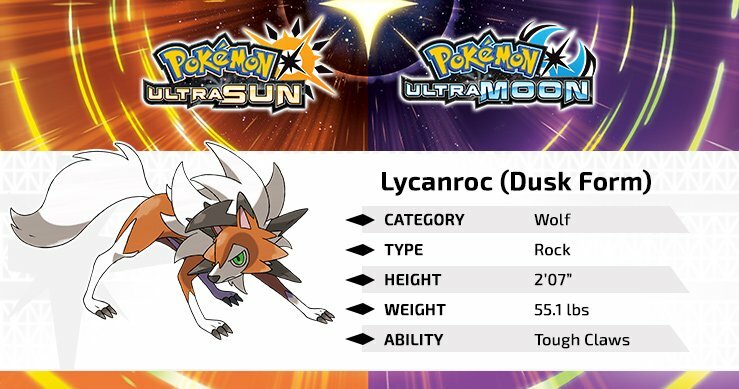 In the upcoming video games Pokémon Ultra Sun and Pokémon Ultra Moon, however, a new version of Lycanroc will be available: Dusk Form Lycanroc. GAME FREAK Pokémon Sun and Moon Director Shigeru Ohmori (大森滋) was on Pokénchi 95 and he revealed Dusk Form Lycanroc on the show. The official Japanese and English website updated with some info confirming this new form a little while after the show aired in Japan. Dusk Form Lycanroc features characteristics of both Lycanroc Midday Form and Lycanroc Midnight Form. It stands on all fours and has behavioral traits similar to Midday Form, but when it attacks, its eyes glow red, much like Midnight Form. Dusk Form Lycanroc has a tranquil demeanor and always remains calm. This Pokémon is obedient towards a Trainer that it trusts. It has an intense fighting spirit, and as a result, prefers to do combat at close quarters. Rockruff caught through normal gameplay cannot evolve into Dusk Form Lycanroc. 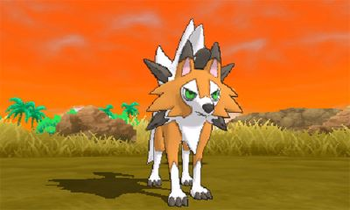 A unique Rockruff that can evolve into Dusk Form Lycanroc will be wirelessly distributed via Nintendo Network as a special early purchase bonus for owners of Pokémon Ultra Sun or Pokémon Ultra Moon. Players will be able to receive their Rockruff from the games’ launch on 17 November until 10 January 2018. More details are planned to be announced later this year. Dusk Form Lycanroc shares some of the aspects of Midday Form, such as a four-legged stance and obedience toward its trusted Trainer. But it's also like Midnight Form—at the moment it attacks, its eyes turn red! Around its neck are four rocks like those of Midday Form, while the mane on its head matches that of Midnight Form. Little things don't shake the tranquil demeanor of Dusk Form Lycanroc, but it has a well of intense fighting spirit hidden within, and as a result, it relishes combat at close quarters. It also tries to use Counter when battles get intense. The moves that Dusk Form Lycanroc can learn also seem to reflect the characteristics of both Midday and Midnight Forms. Dusk Form Lycanroc learns both Accelerock and Counter—moves favored by Midday Form and Midnight Form Lycanroc, respectively. Accelerock is a Rock-type physical move that always goes first. In Pokémon Sun and Pokémon Moon, only Midday Form Lycanroc could learn this move. Midday Form could learn this move when it evolved from Rockruff. Counter is a Fighting-type move that inflicts double the damage received by an opponent's physical attack. In Pokémon Sun and Pokémon Moon, Midnight Form Lycanroc learned this move when it evolved from Rockruff. Dusk Form Lycanroc has the Ability Tough Claws, a different Ability than either Midday Form or Midnight Form. Tough Claws greatly increases the power of moves that make direct contact. A Dusk Form Lycanroc with this Ability would likely favor a different style of battle than Midday Form or Midnight Form. Only special Rockruff can evolve into a Dusk Form Lycanroc, and neither this Rockruff nor Dusk Form Lycanroc can be caught in normal gameplay. But you can get a special gift of this Rockruff as an early purchase bonus with Pokémon Ultra Sun and Pokémon Ultra Moon. Players will be able to receive a special Rockruff that can evolve into Dusk Form Lycanroc via Nintendo Network from Friday, November 17, 2017, until Wednesday, January 10, 2018. 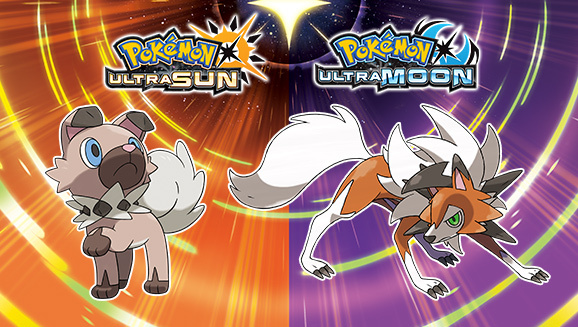 Evolve this special Rockruff and have an adventure in Pokémon Ultra Sun and Pokémon Ultra Moon together with your Dusk Form Lycanroc! An issue where the game would occasionally freeze during a cutscene immediately after selecting Litten to be your first Pokémon partner during the game’s prologue and thus prevent further progress has been fixed. An issue where the move Wide Guard would not behave properly in relation to some Z-Moves has been fixed. An issue where the move Ion Deluge would not behave properly has been fixed. An issue where a learned move would be forgotten if you used BP in places like Mantine Surf Spot or the Battle Tree to learn a move. Fixes bug where Curse, Forest's Curse, Power Trick and String Shot could cause the game to freeze during Live Competitions. A brand-new story — In Pokémon Ultra Sun and Pokémon Ultra Moon, a brand-new story unfolds featuring Necrozma alongside the Legendary duo Solgaleo and Lunala. Ominous dark clouds begin to spread and the secrets of Necrozma and the Alola region, which were never disclosed in the previous games, will finally come to light. Different Pokémon — As you explore Alola in Pokémon Ultra Sun and Pokémon Ultra Moon, you’ll meet Pokémon in the region that didn’t appear in Pokémon Sun and Pokémon Moon. You’ll see some familiar faces, too, alongside some newly discovered Ultra Beasts. New areas to explore — Discover new areas across Alola like Pikachu Valley, new beaches and more, as well as the worlds that lie beyond the Ultra Wormhole. Players can ride on the Legendary Pokémon Solgaleo and Lunala to travel through the Ultra Wormhole to reach the various worlds that lie beyond it. New Z-Moves — In Pokémon Ultra Sun and Pokémon Ultra Moon, players will discover a new Z-Power Ring which, when activated, allows them to use an even wider variety of Z-Moves. There is a variety of brand-new Z-Moves for players to discover on their adventures. Exciting new gameplay features — Players can take to the waves with Mantine Surf, take amazing pictures in the Alola Photo Club, fight their way through the new Battle Agency and more on their adventure through the Alola region. Compatible with the Pokémon Global Link! Click here for the Imageboard thread for more screenshots. This page has been viewed 5639 times.